So far this summer, I've been involved in a number of "worthy causes", fundraisers, or charitable events. Here's a bit about a few of them. This event wasn't exactly a charitable event, but it was fun. The 8th Regiment of Missouri Volunteers (Civil War reenactors) help to open Grant's Farm for the season and the new Ulysses S. Grant Museum at Whitehaven National Monument across the street. 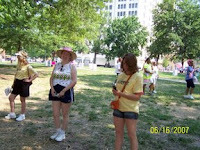 I walked the full route of the Susan G. Komen Breast Cancer Awareness Walk on June 16th in downtown St. Louis. This year the walk didn't go past the Arch, much to my chagrin. In past years I help to entertain walkers by singing with my chorus, The River Blenders. Since our director couldn't make it this time, I took up my writing pal Debbie Hull's offer to walk with her Jazzercise group from St. Peters. I realize now that I desperately need to get in shape like these gals! Another annual summer cause I like to help out with is "Taking Jesus to the Streets" a street-festival/Vacation Bible School that is put on by Bethlehem Lutheran Church, St. Louis. Each week, the BLC singers, helpers and volunteers go to a different neighborhood on the northside and share the Gospel through song and skits, arts and crafts, snacks and prizes. It's a lot of fun. And you meet some great kids. A new project I helped out this year was a "Don't Go to Church (Be the Church)" project to help put insulation in the ceiling of the Peace ESL Center on S. Grand Avenue in the city. It's an older brick building in the heart of the immigrant community of St. Louis. They have a "computer lab" of old, donated PCs to help teach newcomers computer and English skills so they can find work in their new country. I'm glad that I got to help out at this great community center. Probably the most enlightening experience of my summer so far has been going out one evening with the "Extreme Faith Ministry" group from Faith Lutheran Church in Oakville. Every other Wednesday, this very organized group of believers goes into the city and feed the homeless and other street people. And is it ever appreciated! At the first stop on the corner of Locust and 14th Streets, we fed about 150 people. The organizers then bought some more food to go from there into the abandoned warehouses along the river--right next to the Arch. Yes, within a yard or so of the National Monument sleeps several dozen people in an old warehouse without windows, lights or running water. 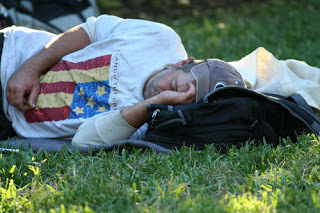 And many of the homeless are working--they just can't afford the high rents to live in the city. The visits and friendships are as welcomed as the food is, too, I learned... And sometimes after these homeless people get back on their feet financially, they come and help out with Extreme Faith Ministry as well. That's my summer so far... It's always good to get out there and see what's happening in other parts of your community. I suggest you give a try yourself and see what happens.